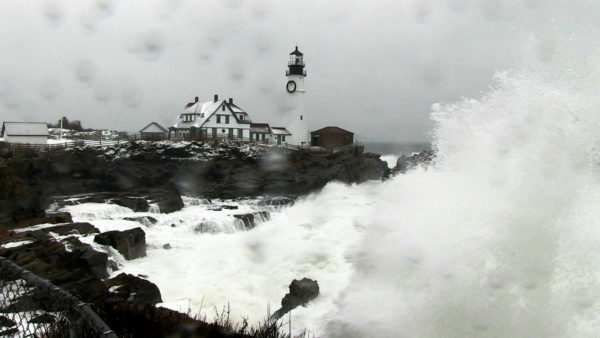 Offshore wind gusts of almost 40 mph drive waves against the rocks at the foot of Portland Headlight in Cape Elizabeth in January. About 50 York County town officials and employees attended a meeting on Wednesday to hear from the Federal Emergency Management Agency regarding the process to appeal recently released flood insurance maps. The meeting was one of two held by FEMA, the Maine Department of Agriculture, Conservation and Forestry-Floodplain Management Program and STARR, a FEMA mapping contractor. The meetings were organized to describe the flood map review process and address initial questions regarding the flood insurance maps that were released in April. Brian Caulfield of STARR explained the entire process of appealing the map’s findings and gave a specific timeline of events leading to what will, hopefully for several coastal towns, lead to revised flood insurance maps. The FEMA maps released in April are actually the third round of new maps. In 2010, FEMA withdrew a preliminary map update for the area after a huge number of municipal appeals challenged their accuracy. Updates were issued in 2013, but the finalizing of those maps was put on hold after Plymouth County in Massachusetts challenged their own maps. The maps are used to set rates for federal flood insurance, which is required for mortgages on properties in flood zones. Several coastal Maine towns, including Kennebunkport, Old Orchard Beach and Harpswell, are disputing the revised maps, saying they are not scientifically accurate. Wells, for example, said the new maps include 70 additional parcels of land, including the town facilities at Wells Harbor. If the maps are not corrected, Wells Town Manager Jonathan Carter has said the town would have to upgrade its infrastructure. The towns have agreed to share the cost of hiring Ransom Environmental to develop an accurate, science-based model to accurately depict flood zones in one of the state’s most populated areas. Ransom will create a highly specific, two-dimensional model for new flood maps, which will incorporate wave energy and still water levels to show a more realistic depiction of what happens in these coastal communities in an extreme storm. The FEMA appeals process grants towns 90 days to appeal the maps and submit their own corrected maps for approval, at their own cost. If the appeal is successful, FEMA would incorporate the new drawings into revised maps. Richard Verville, the acting risk analysis branch chief for FEMA Region 1, said it’s not unusual for towns and communities to appeal flood insurance maps and that the agency is prepared to help. With Wednesday’s meetings in the books, the process for appealing the maps is in motion, said Verville. If all goes according to plan, the 90-day appeal period will begin next February, and final maps could become effective in July 2019. There are currently more than 6,900 flood insurance policies in effect in the state, with coverage totaling more than $899 million, according to the maine.gov website.